"Sometimes we forget the sheer brilliance of our home-grown guitar makers. 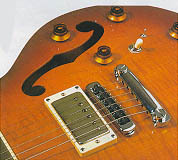 When Keith G.Bennion said he had a guitar TGM might like to see, he was being typically understated: the thinline jazzer that subsequently appeared proved exceptional. Clearly inspired by Paul Reed Smith - note the headstock and the general McCarty Hollowbody vibe - this KGB has an up-sized Les Paul / down-sized Gibson semi outline which feels eminently comfortable strapped on or seated, while the extra room given by the large Florentine cutaway makes the top frets super accessible. Check the build: subtly arched hand-carved bookmatched flame maple top, two piece mahogany body with routed sound chambers, finely scraped natural edge binding, the subtle vintage sunburst (Keith uses a thin acrylic lacquer: 'it has similar properties to cellulose,' he claims, 'but it's less likely to crack or craze'). The wide-flat neck is carved from two-piece centre-joined mahogany; the snowflake inlaid ebony fingerboard features immaculate fretting - even the fingerboard edges are slightly rounded to ease the hand. The hardware includes Sperzel Trimloks, a passive Mike Christian piezo-loaded tune-o-matic-style bridge and stud tailpiece, a PRS McCarty humbucker at the bridge and a Seymour Duncan Jazz at the neck. The master volume lies closest to the tailpiece, the piezo volume to its right; below these are more controls for the magnetic pickups - a tone control, a 3-way toggle selector and a mini-toggle to voice both humbuckers in single-coil mode. This hybrid jazz thinline's piezo sound is at first a bit thin in the bass, a little piezo-like and pingy; adding some warming lower-end EQ helps, revealing a nicely textured electro-acoustic sound - dry sounding, with good string separation - which would no doubt sound best running into an acoustic preamp or dedicated acoustic amp. The PRS McCarty sounds quite PAF-like: brightish and clear with smooth mids, a well-balanced bass and slinky highs; the Duncan is louder with a thicker, fluid tone that really suits the jazzier aspects of the guitar. The piezo blends in really well, especially to the twin pickup sound where it adds crystalline highs and articulation to the smoother magnetic tone. All in all this is impressive stuff - an excellent custom guitar."